Lesser known, outside of philosophical, historical and theatre circles is his tutor, the playwright and essayist, Seneca. Dying Every Day is James Romm’s attempt to correct that lack. Seneca was in his time and continues to be an enigma, a stoic who yet placed himself next to the seats of power and accumulated great wealth because of his associations. He was often viciously criticized by fellow stoics for weakness and corruption. His essays often seem attempts to reconcile stoicism with luxury. The result, according to Romm, is that even today after two thousand years of study we are unsure of exactly who he was. It may well be that he wanted to influence the empire’s leaders, and Nero specifically, with an ethical foundation that would create Rome’s first “philosopher kings.” Romm further speculates that, were he to fail in that lesser goal, it was not out of the question that he would gladly have taken that office himself. Written in a comfortable and decidedly non-academic style, Dying Every Day is extensively researched and, will be welcomed by both scholars and those with a more casual interest in history. In addition and most important to our time is the detailed study of power politics and the inevitable consequences of weakness and corruption allowing power to be concentrated into few hands. Lucius Annaeus Seneca was well known as a writer and philosopher when Nero was thrust on the throne at 17 years of age by his ambitious mother Agrippina, who demanded his obedience and his loyalty. She wanted the boy’s mind to be trained by the best, and Seneca was reputed to be the best. Oh, she was a piece of work, that one! Scheming, manipulative, sociopathic, the daughter of a revered general, Germanicus, she cleared the way for Nero’s ascension by conveniently murdering, exiling or otherwise rendering powerless all possible claimants to the throne so recently vacated under suspicious circumstances by her husband Claudius. Nero was her son by a previous marriage. Claudius had another son by a previous wife. Britannicus was not adopted as Nero was. It was a tossup for awhile which Agrippina would choose to champion. Of course, her first choice was Nero, but when he defied her she threatened to back his younger half- brother instead. Although they were raised as siblings and were known to be close, it was clear that the one she did not back would have to be disposed of. Nothing is more inconvenient than a spare prince. Much has been written about the convoluted familial relationships in the upper classes of ancient Rome, but the dysfunction reached perhaps its apex with the machinations of Agrippina. Add to that the acquisition of absolute power by a sensitive boy with an artistic soul, at an age when most young men are just discovering who they are and what they want and you have a recipe for dynastic disaster. One is tempted to feel sorry for the poor boy. He was the ultimate overindulged misdirected child pressured into a life he did not want and for which he had no talent. Seneca tried. He was determined that Nero would be Rome’s first “philosopher king,” but Nero had no head for philosophy any more than for government. He loved the power, but he really wanted to be an artist, a poet and musician. We do understand how artistic sensitivity can work both for and against the person who possesses it. He didn’t see court intrigues and political maneuvering like a stoic philosopher such as Seneca would, as just the process of governing. He took it all personally and felt deception deeply, becoming more and more paranoid as the years went by and more needy of acclamation and validation from his court, the senate and the public. In the end, he killed everyone who was a threat to him, starting with his mother and brother and eventually including anyone who didn’t praise him enough or who fell asleep during one of his concerts. Also included was his teacher Seneca who opened his veins shortly before Nero’s fall and suicide. What is most striking about the sequence of events, though, is the role of the Senate. Almost to a man, they did nothing to prevent the madness. Some protested and were killed. The others acquiesced. Most realized with a good deal of sanguinity that Nero could order their deaths at any time. The greatest legislative body in the world and they gave their power away to a teenager. Here are lessons to be learned by these political intrigues. Romm does not flinch in laying proper responsibility for Nero’s reign at the Senate’s feet. Had they not been so aristocratic, had they not given themselves over to the perks of office and the luxury of class, had they not laid aside responsibility for governing, the emperors may not have acquired so much central power. By the time of Nero’s reign, every thought of restoring the Republic was dead, nit was too late, just a distant and nostalgic dream. The Praetorian Guard, personal bodyguard to the emperors, became the kingmakers of their day in the absence of Senatorial leadership. They assassinated Caligula and placed Claudius on the throne. When Nero’s excesses turned the populace against him, the Praetorian Guard hunted him down and would have executed him by wedging his neck between the branches of a tree and beating him to death with wooden rods had he not escaped that fate by plunging a dagger into his throat. This is a well-researched and engrossing account of a time when rational thought was set aside in favor of passion and when good men cowed in the face of tyranny and did nothing to stem it. Dying Every Day is an apt title. Governments do not fall in one day or because of a single event. Indeed, the collapse of a society is an ongoing process that happens every day of its existence unless it is prevented. 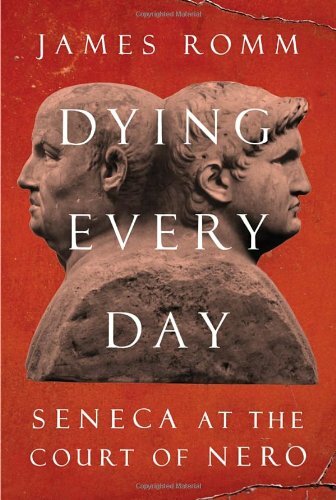 As a popular historical work, Dying Every Day is highly recommended for anyone wishing to know how power is acquired, used, abused and to what ends. The names and the institutions have changed. Not much else has.